A MEDesign Real Wool Fleece Underblanket is the natural way to a more restful and comfortable night’s sleep. The pure wool fleece keeps you cool in summer months and warm in winter. Sleeping on a real wool fleece is well known to be beneficial to back pain sufferers. People who suffer from arthritis, rheumatism or general stiffness can also benefit. In use the fleece should be placed on top of the mattress (with the fleece uppermost). Cover it with the bottom sheet and make up the bed in the usual way. 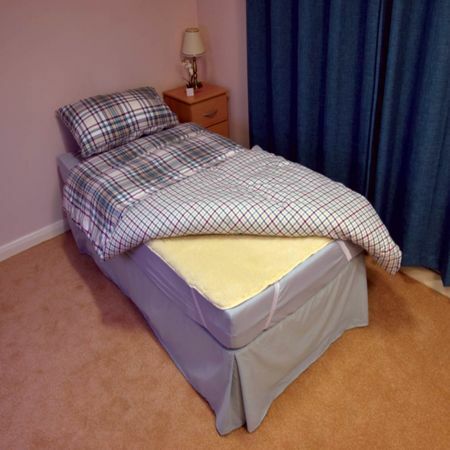 MEDesign’s Fleece Underblankets are made in the UK from pure new wool, which is specially treated to be machine washable, and they carry a one year warranty. The MEDesign Bedboard provides the ideal solution to that oversoft or sagging mattress. Support your feet and legs with our variable angle footrest.